Is your site on a hot topic? Does your site attract some difficult commenters? If the answer to any of these questions is yes, you need our plugin FV Thoughtful Comments which adds advanced front end comment moderation and cool thread and user banning mechanisms. We've stress tested FV Thoughtful Comments on political debate and it knocks Intense Debate and Disqus flat on their backs. The big advantage of FV Thoughtful Comments is that it's part of your core WordPress install so your comments stay local. Local comments mean you are not dependent on someone else's server. Also by keeping your comments local and published on your own site, you get huge SEO advantages for fresh content. Take the Mercedes of WordPress comment management for a spin. You'll love to be back in charge of your own site again, able to keep even the riliest commenters and nefarious spammers at bay. We recommend using WP Spam Free FV Antispam (much lower server load than WP Spam Free) in conjunction with FV Thoughtful Comments to keep the spammer right off your site. This is the greatest feature of this plugin. It lets logged in editor and admin users to do the following actions with comments while they are displayed bellow the post. No need to get into WordPress Administration Panels to remove the bad comments. You can see all the features in action on the screenshot. 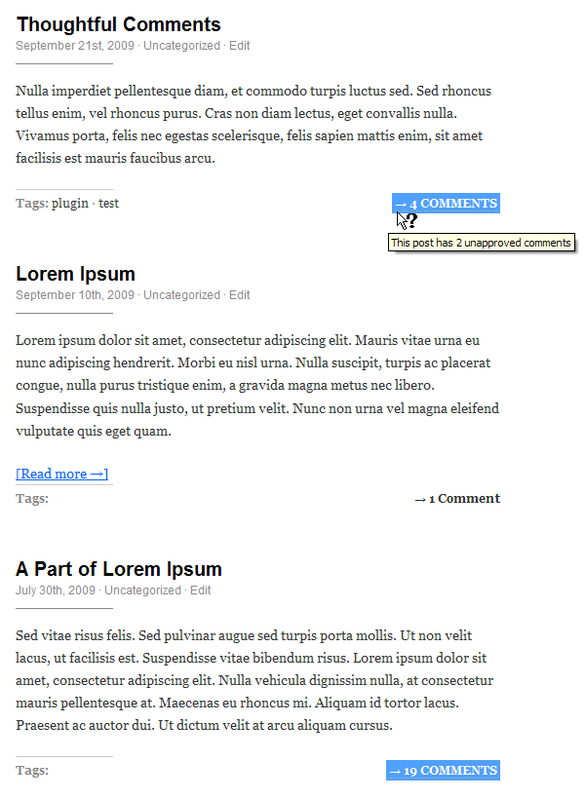 Having a frontend comment moderation system is nice, but it's useless if you can't see the unapproved comments there. That's why our plugin enables logged in editor and admin users to see the unapproved comments bellow the articles, so they can delete or approve incoming comments right away. The name of comment author is highlighted if it's an unapproved comment. 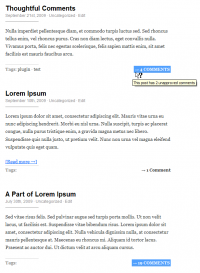 When viewing the blog index or archive pages, the number of comments listed bellow each of the articles is highlighted if there are any unapproved comments. You can hover your mouse over it to get the actual number. If you are moderating all the comments comments coming to your site - even for the registered users - our plugin let's you put desired users out of this moderation queue by a single click. Then all the following comments from the user will be auto-approved. You can review this setting in WordPress Administration Panels - User Management too. When the user is Unmoderated, it means that all his comments are automatically approved.